This book is about one of the most attractive areas of investments that is Initial Public Offering. This book gives you whole idea about Initial Public Offering. 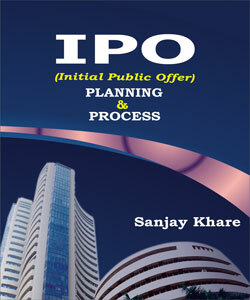 The main object of this book is to provide all information relating to IPO and performance of IPOs. Every chapter has been explained point wise in very simple language. 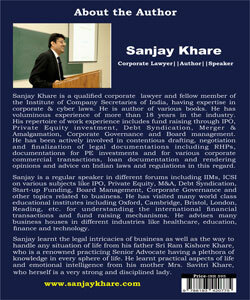 Sanjay Khare is a qualified corporate lawyer and fellow member of the Institute of Company Secretaries of India, having expertise in corporate & cyber laws. He is author of various books. He has voluminous experience of more than 18 years in the industry. 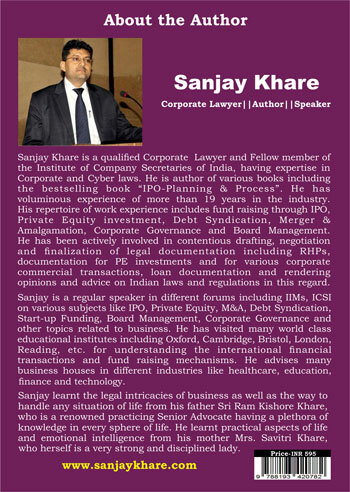 Sanjay is a regular speaker in different forums including IIMs on various subjects like IPO, Private Equity, M&A, Debt Syndication, Start-up Funding, Board Management, Corporate Governance and other topics related to business. This practical guide brings together the information in one place that companies and their advisors need to know as they prepare for an initial public offering. This book gives whole idea about Initial Public Offering. Taking a company public is every entrepreneurs dream. It is also a complex process that often intimidates entrepreneurs and requires specialists in many disciplines such as merchant banker, attorneys, consultants and public relation executives. This book is for investors, Directors, students and for those who wants to know more about IPO, How IPOs are arranged and their performance. Directors of companies planning IPO will find this book helpful. 5. How IPO is Valued? 6. How does IPO Pricing Work? This book covers regulatory aspects & latest amendments in IPO norms. Comprehensive and practical guide for Entrepreneurs, Academicians, CEOs, Students & Professionals. Detailed case studies of a number of high-profile IPOs. The book provides valuable insight into many fundamental IPO matters. This book is about Company Directors Roles & Responsibilities. Every chapter has been explained point wise in very simple language. 1. The book covers type of directors- executive, independent, nominee, women and their appointment, duties, responsibilities. 2. Selection of independent directors, appointment criteria, duties etc . 3. Role of Independent and women directors on Board of the Companies. 4. Disqualification and removal of directors and related cases. 5. Liabilities on directors including vicarious liabilities in different situations with practical cases. 6. Board management and role of committee members their responsibilities. 7. Recent amendments in companies act, rules and listing guidelines. 8. Some recent popular cases in NCLT etc. 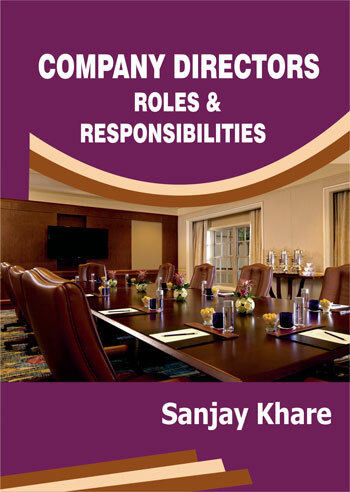 The book is comprehensive and practical guide for Company Directors, Committees of Board and Women Directors.